What problems does Eucles solve? If you recognise these, take a look at Eucles. 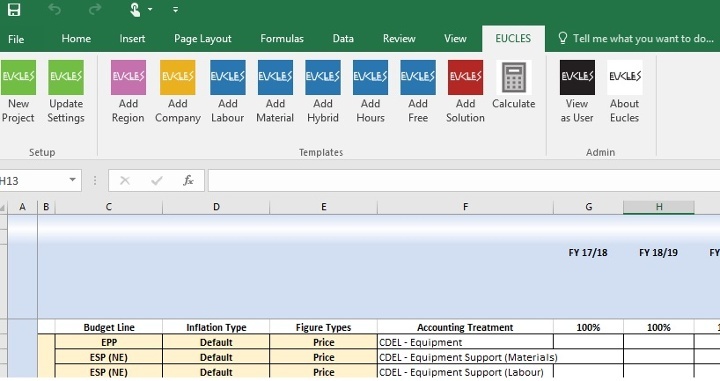 Eucles is an excel add-in that dramatically speeds up the process of creating a Price to Win. It is build by Price to Win analysts, for Price to Win analysts. Its primary purpose is to speed up the process of producing a Price to Win. Eucles helps you to integrate different estimates (e.g. parametric and bottom up) and compare them. You'll be able to ensure both estimates use the same assumptions (e.g. inflation, labour rates and overheads) and quickly identify the key differences and assumptions. Eucles has a fast and easy to use user interface that mirrors the Amplio 5-step Price to Win process. Once a project is created, the user builds company profiles of the competition. This integrates your strategic competitive intelligence with the Price to Win analysis. Furthermore, once you have created a competitor profile you can re-use it in your next Price to Win assignment. This makes it much quicker to build Price to Win models. Eucles has five templates for estimating different work packages. This makes it very easy to compare different estimate types. For example, you could add a parametric estimate and a bottom up estimate of the same work package. Eucles allows you to quickly switch between these estimates, so you can see the difference they make to a solution. This enables very quick 'what if' analysis that can be performed live in Price to Win reviews. Eucles works by taking a standard set of salary and economic data. These are sourced from public info and users can edit or add to them. The economic data allows the Price to Win to account for multiple inflation rates in the same Price to Win. For example, electronics can be inflated with an electronics index whilst labour can be inflated using private sector wage indexes. Eucles takes the salary data and builds a company profile, representing a competitor. Different competitors have various overhead structures which converts the salary into a labour rate, which is used in the bottom up estimates. However, Eucles can quickly take labour rates from other sources (e.g. a parametric estimate) and compare the difference each set of labour rates makes. Eucles then facilitates estimates of different work packages. For example, Eucles comes with templates for estimating software using productivity metrics like lines of codes per hour and defect fixing. All these estimates are built up into solutions that the competitor could offer. Eucles helps validation and verification of the Price to Win by providing 10 standard graphs depicting the assumptions in the Price to Win. Experienced analysts will quickly spot trends in the graphs and errors will become apparent quickly. How can I try Eucles?